The last American map is that of southeast South America. The distance scales are back, and the latitude markers continue. At sea, there is a semicircle of compass roses enclosing two ships, one again with lateen sails. Fascinatingly on the waters of the American maps, no two ships are quite the same. The coastline is suitably delineated and labeled. In the upper right is the Strait of Magellan, so labeled. South of it there is an Indian battle taking place on land that in reality is almost uninhabitable. 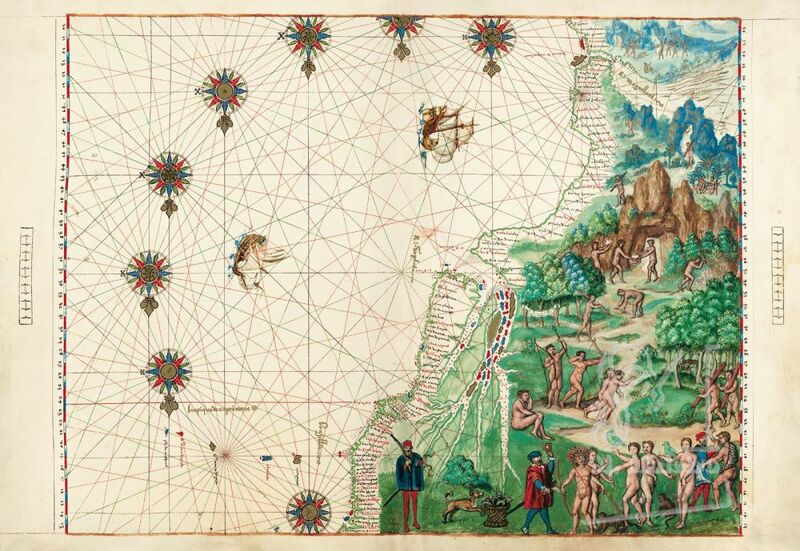 To the north, the Indians are mining, hunting, relaxing, and trading with two Europeans. One other European is carrying a firearm and holding a snake. Additional Indians are harvesting wood, while another seems to try to beat out a forest fire. An empty hammock hangs in the trees. Monkeys, an iguana, a bird, and a European dog are also represented. The Rio de la Plata prominently empties into the South Atlantic at about the center of the map.